PULLMAN, Wash. – The mysterious “milky rain” that hit parts of the Pacific Northwest last Friday was the result of a rarely seen weather phenomenon that began near an ancient saline lake nearly 500 miles away, according to Washington State University meteorologist Nic Loyd. A meshing of independent weather systems that appears to have started in a remote area of southern Oregon ultimately caused dirty-white-colored raindrops to fall in eastern Washington and northeast Oregon, he said. “It was an unusual convergence of weather factors that set up the event. Drifting ash from a volcanic eruption would have been easier to figure out,” said Loyd of WSU’s AgWeatherNet. The National Weather Service received reports Friday afternoon of ashy debris coating vehicles and windows as a rainstorm moved into more than 15 cities, including Spokane and the Tri-Cities in Washington and Hermiston, Ore. While the ash-like substance has not yet been scientifically confirmed, it’s believed to be from a dust storm clocking 60 mph winds that struck Summer Lake on Thursday night, according to the weather service. Thanks to an exceptional parade of weather events, light-colored dust from Summer Lake’s alkali beds appears to have traveled – distance-wise – the equivalent of an eight-hour car ride before landing, said Loyd. Originally, a large storm that hit northwest Nevada was blamed for the unusual-colored rainfall. First, hurricane-force winds whipped across the Summer Lake region in south central Oregon, “lofting dry, light-colored sands and soils into the air,” Loyd explained. Wister said wind gusts there reportedly lasted throughout the night. 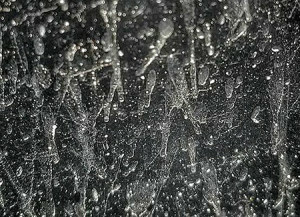 Finally, when the plume arrived, a rainstorm passing through pockets of Washington and Oregon drove the debris downward in the form of milky raindrops.